One of the main characters in Seth Wickersham’s must-read ESPN story on infighting between the most powerful people in the Patriots organization is not technically a part of that organization at all. 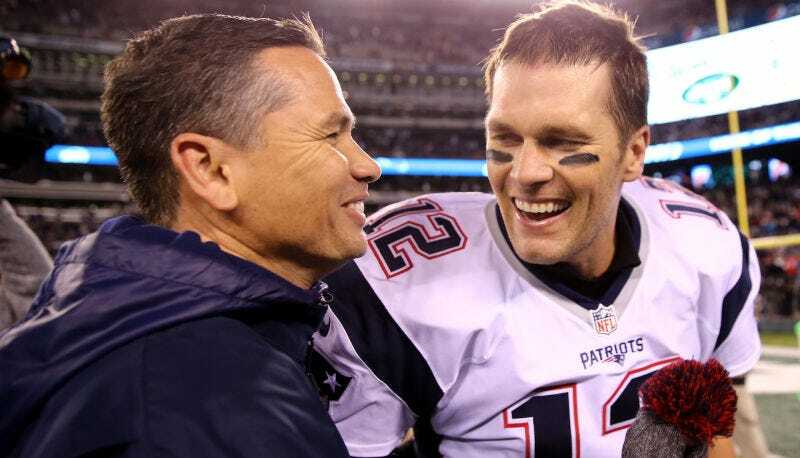 This is Alex Guerrero, Tom Brady’s personal quack doctor and someone who has amassed a great deal of power thanks to his connection to the quarterback, and despite what might politely be called a medically dubious history. Guerrero ran the TB12 clinic, which was right next to the Patriots’ team facility and served as a sort of second training room, one that Brady reportedly pushed teammates to use. This seems to have played a role in cleaving Bill Belichick from Brady, which is honestly just the best and dumbest development, no matter what Robert Kraft, Brady, and Belichick say. Guerrero has mostly kept out of sight, give or take co-authoring Brady’s hilarious book, but he had access to the Patriots team plane and other perks until Belichick put an end to that earlier this season. His simmering disagreement with Belichick and role in the Wickersham piece have thrust him into the public eye. He released a statement on Friday afternoon, and even went so far as to set up a Twitter account just for the occasion. Over the past few years, many people have tried to paint a picture of who I am. But none of these pictures has been complete. I get that many of my beliefs are not mainstream and I know they may differ from others’. But they reflect my experience from over 22 years of practice working with some of the best athletes in the world. I understand that some people may disagree with me about how to treat injuries or how to train in order to maximize potential. I welcome this and think it is normal and healthy in all careers, because it helps everyone learn, grow, and improve. Most importantly, Guerrero makes a point of confirming that Tom Brady is his friend, while not specifically naming Belichick on his thank you list. Many of the athletes I have worked with I consider not only clients, but also close friends. One of those is Tom Brady with whom I have a great friendship that I cherish. It is a privilege working alongside someone with his commitment and discipline. Watching Tom succeed as he grows older has been a personal and professional highlight, because I consider seeing players’ and clients’ achievements in their own careers to be the most gratifying part of my work. Thank you to everyone who has supported me in my career, and to the professional organizations that have allowed me to treat their players—including the New England Patriots. I am grateful to Robert Kraft and his coaches and staff. I am proud to have co-founded the TB12 Sports Therapy Center with Tom, where we’re able to make a daily impact in thousands of people’s lives. That’s settled: Alex Guerrero is Tom Brady’s friend, everyone is happy, and everything is fine.